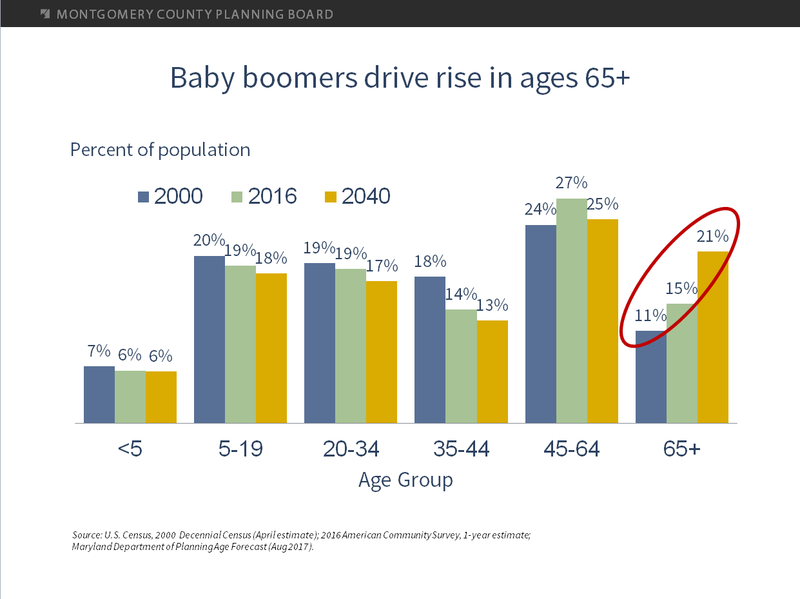 Demographic data released by Montgomery County’s Planning Board shows the rise of seniors in the county’s population. That will have a big impact on the county’s budget in future years. The graphic released by the board below shows the percentage of the county’s population in six age groups. Data sources include the U.S. Census Bureau for 2000 and 2016 and projections from the Maryland Department of Planning for 2040. The only segment of the population showing strong growth through 2040 is people age 65 and over. This group is projected to grow from 11% of the county’s population in 2000 to 21% in 2040. The increasing percentage of seniors in the county’s population will impact the county’s budget on both the spending side and the revenue side. On the spending side, the county has a robust Aging and Disability Services program in its Department of Health and Human Services. The program includes assistance to seniors in locating services, home and community-based care, case management for frail and disabled seniors, subsidies for low income seniors in group homes, respite care, senior community services and senior nutrition. Funding for aging and disability services has grown from $41.5 million in FY16 to $51.4 million in the Executive’s recommended FY19 budget. Given the prevalence of seniors in the county’s electorate, this spending is sure to grow along with the percentage of seniors in the population. The even bigger consequence may be on county revenues. Income taxes generally comprise between 25% and 30% of the county’s total revenues and are second in volume only to property taxes. According to the Census Bureau, MoCo’s median household income over the 2012-2016 period was $100,352. Among householders who were age 65 and over, median household income was $79,275. As that group grows as a percentage of the population, income tax receipts will take a hit. Also, since many seniors are on fixed incomes, it is harder for them to afford property tax increases. (The county increased property taxes in Fiscal 2003, 2004, 2005, 2009 and 2017, the last time by 9%.) The energy tax, which was doubled in Fiscal 2011, is no easier a revenue source for people on fixed incomes than the property tax. Combine the impacts of growing spending obligations, long-term pressures on tax receipts and the county’s growing debt and the rise of seniors will strain the county’s budget. Expanding the tax base through economic growth is the only way out.